The automotive industry continues to evolve around the way consumers research, buy and service vehicles. One thing remains the same in the highly competitive industry — dealers continue to implement marketing strategies and technologies to help drive new sales and service business while at the same time retain their existing customers. Dealers have hundreds of companies to choose from that offer a range of services, from niche programs to full-service marketing companies. Researching and evaluating that many companies can be very time consuming and often confusing. Therefore, we are releasing the Top 10 Companies to Watch in 2018 to help identify companies that are leading the industry with innovative solutions. 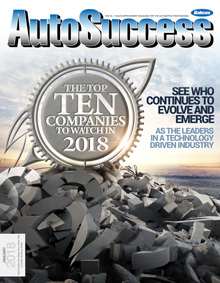 In summary, the companies on this list are leading the industry and are helping achieve measurable results for some of the most demanding and successful dealerships, associations and OEMs in the industry. CallRevu spearheaded call monitoring solutions for the automotive industry. Their full-service call management system enhances sales and service revenue by alerting the dealership in real-time when phone calls are mishandled and by using their industry-leading outbound call center to reconnect with customers on the dealership’s behalf when personnel can’t perform per their stated objectives. CallRevu doubles a dealership’s sales opportunities without increasing marketing expenses by monitoring all important incoming calls in all departments and sending real-time interactive text and/or email alerts with the summary of the call and a click-to-call the customer back when calls are missed or mishandled. CallRevu captures contact, call and appointment information from every call and accurately enters it into the dealer’s CRM and provides free-to-everyone training to help fix the phones. 1: CallRevu tracks, monitors and summarizes all important incoming calls. 2: CallRevu delivers real-time interactive text and/or email alerts when an opportunity is missed or a call is mishandled. 3: CallRevu updates missing contact information on every customer calling the dealership. 4: CallRevu accurately enters the information from every call into the dealer’s CRM. 5: The CallRevu Call Center runs outbound campaigns that follow-up with customers using customizable scripts and targets specific audiences. 6: CallRevu provides free training tools so that a dealership can increase performance on day one and continue improving over time. CallRevu’s call management solution is used by many of the industry’s top-performing dealerships like Germain Automotive, Rick Case, Paragon, and Penske. CallRevu is iMR certified by General Motors, they are the exclusive phone solutions providers for American Honda Motor Company and Acura, they work with Ford Direct, Toyota Central Canada and US Regions, conduct Subaru Training, and are the exclusive Mystery Shopping Provider for Nissan. CallRevu also powers special projects for Chrysler, Lexus and Volkswagen. BOTTOM LINE: Close more deals from the same number of leads. As the leading source of vehicle history information for buyers and sellers of used cars, CARFAX has the most comprehensive vehicle history database available in North America. In fact, millions of consumers trust CARFAX to provide them with vehicle history information every year. CARFAX receives information from more than 100,000 data sources, including every U.S. and Canadian provincial motor vehicle agency plus many auto auctions, fire and police departments, collision repair facilities, fleet management and rental agencies and more. With all these data sources, dealers can get vehicle history reports which helps to acquire, market, sell and service vehicles so they know exactly what they’re getting into with every vehicle. Additionally, used car listings allow both consumers and dealers to become educated on vehicle history so consumers arrive to the store informed and ready to buy. In turn, this removes the biggest barrier to used car sales – Doubt. BOTTOM LINE: Leading online destination for car shoppers. product, Google Home, puts Google in your living room. Google Wi-Fi connects all the devices in your home effortlessly and Project Fi quickly took market share from the traditional cell phone carriers. These are just the innovations we already know about that are available today. 2018 should bring us even more to look forward to with new ways to effectively connect with the consumer. With all the innovation going on at Google, it would be easy to skip over some of the great products they have been delivering. This is why in December of 2017, Google released their Guidebook for dealers, which lists all of the strategies that are essential to helping dealers win in the digital space. Google will spend much of the 2018 year helping dealers implement marketing strategies from the playbook. Additionally, as of 2017, auto search volume on YouTube is now exceeding Google Search, and Google made major strides on YouTube to serve their 4 million daily views on in-market auto content. If you are not advertising your dealership using online video, you are starting to miss out on entire groups of car buyers. Google brings a very targeted solution to a historically unmeasurable medium. CarSaver is a fast, fun and easy way for consumers to find the car they want for the price they want to pay. They can get offers to buy, finance and insure their next vehicle, all in one place, with the help of a Personal Auto Advisor who guides them through the entire process. CarSaver offers Hassle-free buying and worry-free driving through their lifetime warrantee which is included with car buying. The warrantee covers engine, transmission and drive train for as long as consumers own the vehicle. 1. Promotion: CarSaver is promoted at Walmart and through Univision’s vast TV, radio and online network. 2. Customer Experience: After CarSaver customers use the platform to find the car they want, we connect them with a certified dealer they can trust. 3. Appointments: CarSaver delivers exclusive appointments to certified dealers that have a closing ratio above 50 percent. • CarSaver’s Certified Dealers are promoted at Walmart and through Univision’s vast TV, radio and online network. • CarSaver’s Certified Dealers get exclusive appointments that close above 50 percent. BOTTOM LINE: No. 1 Way to Buy a Car. OfferLogix increases customer engagement by using accurate, compelling and compliant payment options to pull customers deeper into the sales funnel. This patented process evaluates every program offered by every lender the dealership uses to provide customers with the most attractive loan and lease payments on every new and used vehicle in the dealership’s inventory. This allows dealers to display real payments on real vehicles on their dealer Websites, social media and throughout their digital marketing without sacrificing profit margins. On average, consumers consider up to six dealerships online but only visit 1.6 dealerships before making a purchase. This means that being the first to engage with a customer can significantly increase a dealer’s chances of making a sale. Therefore, some of the most innovative companies in the industry are using OfferLogix to increase customer engagement and turn more online shoppers into buyers. OfferLogix enables dealers to standardize payment offers and disclaimers across all their marketing channels. This includes inventory search pages, vehicle details pages, banner ads, landing pages and social media platforms. OfferLogix also gives dealers the ability to export compliant lease, loan and balloon offers to third-party advertising agencies so they can be used in direct mail and email campaigns. OfferLogix’s Search By Payment™ tool allows consumers and dealerships to search new, used and certified pre-owned vehicles, together or separately, based on their desired payment and preferred financing type — lease, loan or balloon. It also allows customers to narrow their searches based on financing term, vehicle color, year, make, model, trim and body style (coupe, sedan, SUV, etc.). This gives consumers the convenience, clarity and transparency they want while giving dealerships an effective new way to engage with consumers without sacrificing profit margins. Digital marketing companies, online sales processes and dealerships across the U.S. and Canada use OfferLogix because it gives them the ability to create compelling lease, loan and balloon offers on their new and used vehicles and standardize their payments and disclaimers across all their traditional and digital marketing channels. BOTTOM LINE: Real loan and lease payments on real new and used vehicles. Did you know 90 percent of customers want to experience sales and service without coming to your store? Customers value their vehicles and their time. They want to buy and service from dealers, but choose to do so with dealers who offer the most convenience. Within a few short years, out-of-store experiences for automotive customers will be the norm because they break down your physical walls and extend your reach into your customer and prospect’s home and office. It’s no secret they don’t have the time (or are too fearful) to visit the store, but what if the store could visit them? It’s easy to get service done when you don’t have to experience the service. Think about your own expectation — in this day and age, everyone expects to buy or service everything with the click of a button. Auto retailers are no longer confined by their physical store fronts, only their willingness to work with customers off-site. REDCap is a purpose-built platform for auto retailers that delivers a seamless and branded experience to customers who prefer to work with you off-site. REDCap integrates with your DMS for quick booking and powerful reporting. As you book service appointments, complete service tickets or have a customer on the line for a test drive, the REDCap system delivers your customer a branded, personalized out-of-store experience using your store’s processes and rules. The platform also offers Lyft integration as a shuttle replacement, delivers sold vehicles and even dealer trades and inventory moves. Your customer’s love you for it, and you look like the hero. BOTTOM LINE: Emerging provider of off-site sales and service experiences. Team Velocity is revolutionizing the industry with their advanced marketing technology platform, Apollo™. Made by dealers for dealers, Apollo provides consumer prediction analytics, market research, equity mining and automated marketing solutions from a single dashboard. Using proprietary algorithms to predict and track consumer behavior, Apollo identifies customers who are statistically likely to purchase or service with your dealership in the next 90 days. Apollo then predicts the specific make and model the unique shopper will buy, and sends automated, targeted marketing communications to those customers. The technology can also track customers through the sales funnel all the way to a purchase, allowing retailers to directly attribute marketing campaigns to real sales transactions. Apollo eliminates the need for multiple vendors by combining equity mining with automated marketing, streamlining all communication by automatically generating dynamic campaigns across email, direct mail, paid search, online display, pre-roll, Facebook and consumer portals, and delivering cost-driven results by creating relevant offers to your Perfect Prospects® in the Perfect Market®. Apollo identifies the dealer’s Perfect Prospects, which are defined as those consumers who have the highest statistical probability of buying and servicing now and in the future for the lowest cost. Each ZIP code is automatically ranked and scored by factors like the number of active customers, market share, distance and cost per sale, allowing Apollo to assign an overall marketing score to each ZIP code. Apollo ensures that the Perfect Prospect still owns the vehicle and still lives in the market which eliminates about 30 percent waste in a DMS system. One of Apollo’s unique features is Upgrade Matrix™, a piece of technology that allows Apollo to predict any consumer’s exact upgrade models, based on the sales patterns of other owners who have traded those same models at the dealership. From there, Apollo automatically creates and distributes state- and OEM-compliant offers that include these custom upgrade options with dynamic sales and service offers based on the consumer’s unique information. These offers are distributed across every marketing medium, and drive consumers to personal consumer portals, which function very similar to Amazon Prime accounts. The consumer portals are the fastest Websites available in the industry, all loading in under two seconds, and contain hyper-personalized offers for each customer. BOTTOM LINE: There is a Difference. Approximately 25 percent of all mobile data is spent on a Facebook product. In fact, the average consumer logs onto Facebook 15 times per day and spends an average of 40 minutes per day on Facebook. With consumers spending more time on a Facebook product than anywhere else on the Internet, trust the company who is a Facebook partner and has multiple Facebook Blueprint-certified account managers, SOCIALDEALER. They are one of only five approved vendors to place dealership inventory on Facebook Marketplace and can dynamically place a dealer’s inventory into targeted Facebook ads. This includes dynamically retargeting consumers with the exact vehicle images and details they recently viewed on a dealership’s Website. SOCIALDEALER partners with strategic data sources such as Oracle Data Cloud to provide the most precise in market targeting available. They also provide comprehensive monthly strategy meetings with their dealers to provide in depth, transparent reporting as well as advising on new opportunities available. All of SOCIALDEALER’s Facebook ad campaigns are custom built for the dealership to achieve their goals and objectives. SOCIALDEALER also provides comprehensive reputation management services. They are able to alert a dealership when a new review, positive or negative, is posted online about the dealership. SOCIALDEALER provides reputation response services where they will respond to all reviews on behalf of the dealership. They also have a reputation generation product that increases a dealership’s positive reviews and helps prevent negative reviews before they are posted. SOCIALDEALER’s platform allows dealerships, big or small, to view detailed reporting regarding their dealership’s reputation. This allows organizations of any size to manage all of their dealerships in one place and maintain brand consistency with minimal effort. Located near Washington, D.C. with offices in New York, Portland and Miami, Tier10 is a full-service advertising agency specializing in Tier 2 automotive associations. BOTTOM LINE: Tier10 | Results Matter.